Trim and Energized is a multi-functional supplement for weight and appetite management that boosts your body with natural energy and helps you reach your weight loss goals. Manufactured using naturally derived ingredients by Monterey Bay Nutraceuticals, Trim and Energized not only acts as a natural weight loss and appetite management support but also has anti-aging properties. 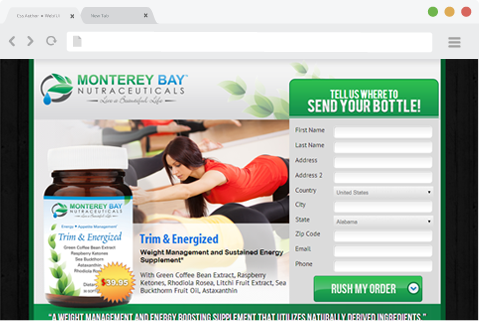 Launching the health product in the market with an innovative, user-friendly and eye catching layout was the goal of Monterey Bay Pharmaceuticals for which they approached the website design experts at 99MediaLab. The company not only needed an attractive landing page to highlight the main aspects of the product, but also a checkout cart to facilitate one-touch purchase of the supplement from the website. As a lot of people are usually skeptical of investing in over-the-counter products, our goal was to present the professional image and health benefits of Trim and Energized with a warm and friendly tone and make sure that the overall website appearance matched the theme and concept of the product. We followed a step-by-step process to target each and every marketing aspect of Trim and Energize with a comprehensive and sleek website design. A fresh and engaging theme was selected that matched the packaging of the product and the company’s logo. Next, we strategically placed the most important information about the product such as its key ingredients, main benefits and nutritional information on the landing page to make navigation easy for the customers. 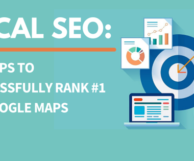 Interactive imagery as well as supportive keywords were also distributed uniformly to boost the rankings of the website on Google and other popular search engines. For promoting quick sales of the product, we added a quick access ‘buy from here’ section on the very first page for effective call to action and generate instant leads. To keep the users engaged and interested and provide them with more information, the landing page was linked to the parent website of Monterey Bay pharmaceuticals. 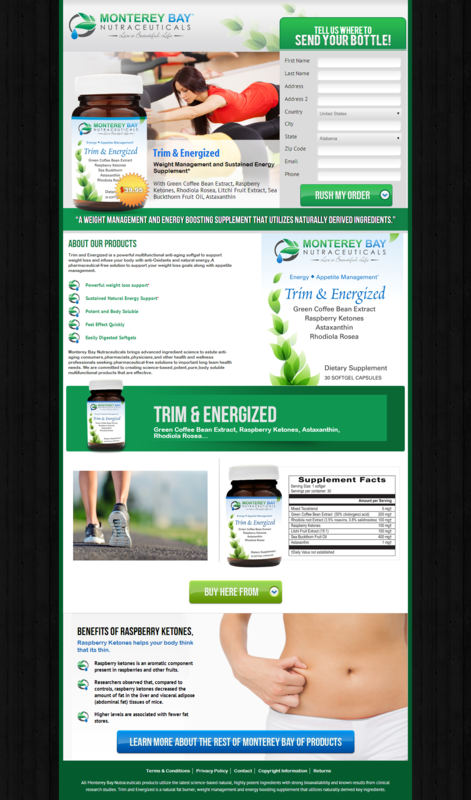 Trim and Energized was looking for a fully functional, simple yet interactive website that not only highlighted the unique aspects of the supplement but also made it easy to sign up and buy the product online with a click. 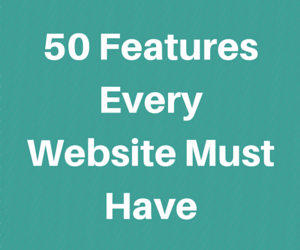 Our web team catered to all three requirements – i.e. design, marketing and usability of the website so that the website stayed on top of search engine results as well as resulted in positive customer retention. 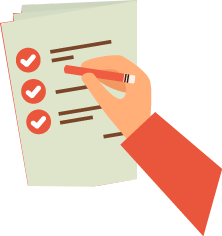 • Content Management System: Aside from website creation, we know that website management is also an important part of the entire process and requires regular attention. Therefore, we implemented a simple and user-friendly CMS design on the website so that the company can add, edit and update content easily without any technical expertise! • Mobile Responsive: As most users now use their phones to browse the web, we chose a mobile responsive design for the Trim and Energized website so it was easily accessible and fully functional on all types of smart devices, phones and tablets. • Search Engine Optimized: A detailed research was done on the relevant industry keywords for weight loss and energy management and they were evenly added to the website’s content in a naturally flowing manner. As there is a lot of competition in the market when it comes to health supplements, our SEO team made use of both on-site and off-site optimization and also inserted the right keywords in the Meta tags, headers and images. • Social Media Integration: Social media is king in the web marketing world these days and is considered the most popular and easily accessible medium for promoting your website to the masses. To give the brand an edge in the market and reach out to more and more customers, our web team integrated links to social media pages for Trim and Energized on the landing page. The experience of working with Trim and Energized was a true delight and everyone from our web design team to SEO professionals were able to participate and put in their best in the project. And the end results say it all – within a few weeks, the traffic on the website has increased by 65% and its search engine visibility has doubled!